The National Bank of Abu Dhabi (NBAD) and aircraft manufacturer Boeing have signed an agreement to develop aircraft financing and leasing opportunities of mutual benefit in the Middle East market. The memorandum of understanding effective immediately represents a landmark collaborative effort aimed at increasing investment opportunities for financial institutions in the UAE and the broader Middle East region involving large commercial aircraft. The two leading firms committed to work together to identify and pursue projects involving structuring and arranging financing and leasing of Boeing products and services to current and potential regional customers. Previously the two organizations have shared ideas to help stimulate the Middle East’s involvement in the considerable opportunities associated with commercial aircraft investment which, as an asset class, has outperformed other alternatives even through economic uncertainties. “Boeing has a long and valued relationship with the UAE, and NBAD has a talented team that leads in business innovation and is a trendsetting bank and aircraft lessor. Today’s agreement represents the next logical step for both of us in meeting the needs of the growing Middle East aviation market,” said Mike Cave, president of Boeing Capital Corporation, the manufacturer’s financing and leasing unit. In Boeing’s latest 20-year commercial aviation market outlook, the Middle East is projected to become one of the largest aviation markets in the world over the next two decades with the need for 2,370 commercial jet aircraft with a value of $470 billion. 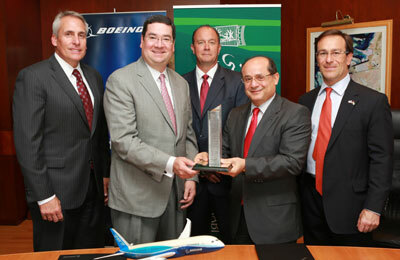 “The airline industry in the Middle East and the UAE in particular is very strong and growing significantly. The National Bank of Abu Dhabi would leverage its partnership with Boeing to support and grow this market,” said Mark Yassin, senior general manager of NBAD’s Corporate and Investment Banking Division. The NBAD and Boeing agreement comes as global economic conditions continue to improve and aircraft financing markets are at their strongest point in several years. In particular, the Middle East’s support for the capital needed to pay for or finance aircraft deliveries in the region has significantly increased in recent years. “Boeing’s experience is that, for 2012, close to 60 percent of our deliveries in the Middle East have been paid for or financed by Middle Eastern sources. That’s a doubling over a year ago and a clear indication that the promise of aircraft investment opportunity that we have advocated is being realized here,” said Cave. The non-exclusive agreement will focus on creating opportunities for NBAD to advise, arrange and supply financing to support Boeing new-aircraft sales and used-aircraft remarketing in the region, with Boeing engaging with the bank in joint projects, training and issues advocacy.